It is difficult to find fresh words to describe the continuing assault on Youth Services across the country. The council has approved a widespread cuts package, including massive £1.6 million cuts to youth services which already suffered £2.3 million of cuts in 2012. This will leave the service over 60% worse off in real terms than in 2011. We believe this will have a significant detrimental impact on young people in Camden as opportunities and positive activities will be slashed. If you are a member of staff, join UNISON today! 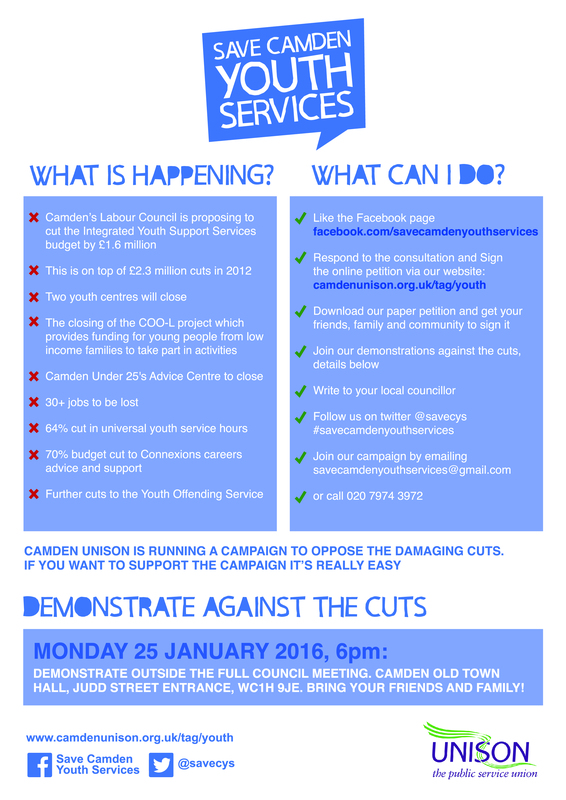 Join our demonstration against the cuts outside the full council meeting at6 PM on Monday 25 January at the old Town Hall, Judd Street entrance, opposite King’s Cross St Pancras station. Meanwhile more bad news from Dorset. We’ve received this message. Next What do you see as the future for Youth & Community Work?